Richard von Strumer‘s latest poetry collection is an utter treat. Inspired by Wang Wei’s Zen text, The Book of Equanimities (100 koans), Richard has assembled his own set of miniatures. He has used the tanka form but added a few lines to expand upon each moment. And this new collection is indeed a celebration of moments – billowing, shimmering, luminous moments in time and place. Through the act of writing, Richard stops still and opens his senses to the world and its splendid detail, and in that loving attentiveness reproduces astonishing movement. In the introduction, Richard cites translator Yoel Hoffman’s observation that a tanka poet observes nature and in that observation observes himself (the tanka is thus a two-way mirror). It is an interesting entry point to Richard’s poems. The pleasure of reading this collection is the pleasure of contemplation, but it is not as one might expect, solely a regard of the sublime. Instead you navigate fablesque and pocket narrative, alongside the ordinary profound. Everyday detail sparks and reverberates. The poetic moment might be a transcendental landscape, but it might also be a trembling morsel of anecdote. This delightful book is a book of sweet harmonies, unexpected, enthralling. Like Dinah Hawken and Bernadette Hall, Richard’s poetry is aglow with wisdom, empathy and a love of poetry. I urge you to add this book to your shelves. Richard von Sturmer is a poet with four previous publications. This entry was posted in Poetry and tagged NZ author, NZ poet, Richard Von Sturmer on February 27, 2014 by Paula Green. 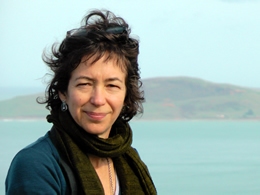 Riemke Ensing will be reading at the Port Chalmers Public Library, 6.00pm on Thursday 27 February. No need to book, just turn up! She has had several volumes of poetry published. Among her recent achievements are first prize in the NZSA Kevin Ireland Poetry Competition 2012, and also in 2012 she received the Lauris Edmond Memorial Award for poetry. This entry was posted in Poetry, Poetry Events on February 25, 2014 by Paula Green. This entry was posted in Poetry and tagged JAAM, Literary Journal on February 24, 2014 by Paula Green. Ika 2 is emitting a high-frequency call for submissions to its second issue. The deadline is 1 May 2014. Ika is the literary and arts journal of Manukau Institute of Technology Faculty of Creative Arts. Ika publishes poetry, fiction, creative non-fiction, visual art and photography, from Aotearoa, the wider Pacific and beyond. Ika’s contributors include writers and artists who are fully submerged and those who are putting their flipper in the water for the first time. There is a submission limit of eight poems, eight images, or 7,000 words of prose. Inquiries are welcome. This entry was posted in Poetry and tagged Literary Journal on February 24, 2014 by Paula Green. The winner will be announced at the Auckland Writers and Readers Festival in Auckland on Saturday May 17. The prize for 2014 will be $12,000. This entry was posted in Poetry, Poetry Awards and tagged Sarah Brooom on February 24, 2014 by Paula Green. The publication of this, the last book from The Holloway Press, will be celebrated at the Gus Fisher Gallery, 74 Shortland Street, Auckland, at 5.30pm, Wednesday March 5, 2014. Dinah Hawken and John Edgar will both be present to speak, read and to sign copies of the book. Some stone pieces by John Edgar will also be on display. This is a last opportunity to acquire copies of this beautiful book (50 copies only) at the pre-publication discount of 20%, $280. For further details about the book see the attached file. Twenty-one new poems by distinguished poet Dinah Hawken together with eight drawings from stone rubbings in crayons and pencils by leading sculptor John Edgar. Poet and artist have worked closely together for several years to produce this profound and moving book. page : stone : leaf is designed and letterpress printed by Tara McLeod on a Littlejohn cylinder press. The type is 12pt Helvetica linotype set by Longley Printing Co. Ltd. Images printed by GTO printers. Binding is by Design Bind Ltd. The paper is 290gsm Tiepolo, mould made in Italy. Hardbound, 21 x 22 cms. 42 pages.55 copies. Price until 10 March 2014, $280; from March 11, 2014, $350. This entry was posted in Poetry, Poetry Events and tagged Dinah Hawken, Poetry book launch on February 18, 2014 by Paula Green. 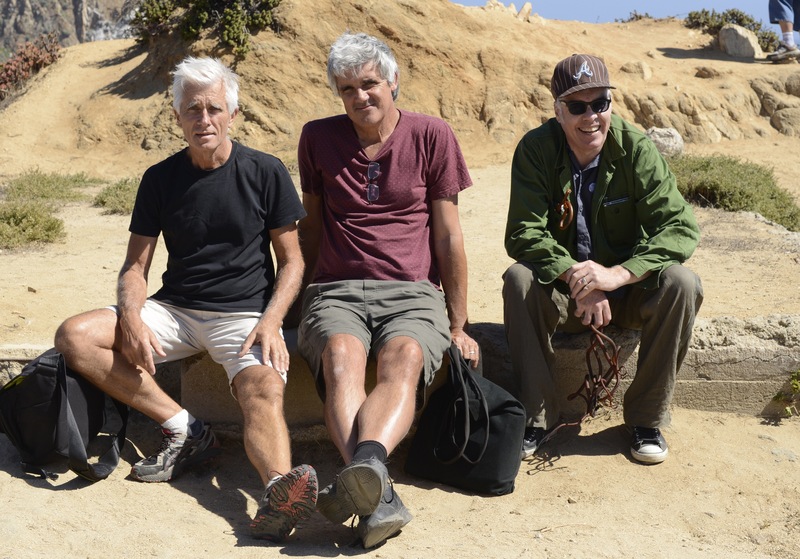 As participants in the travelling exhibition, ‘Kermadec — Art Across the Pacific,’ Gregory O’Brien and Bruce Foster stayed in an apartment in Santiago de Chile between March and May in 2013 while the show was on. Both men went exploring the city, one with camera and one with pad and pen. 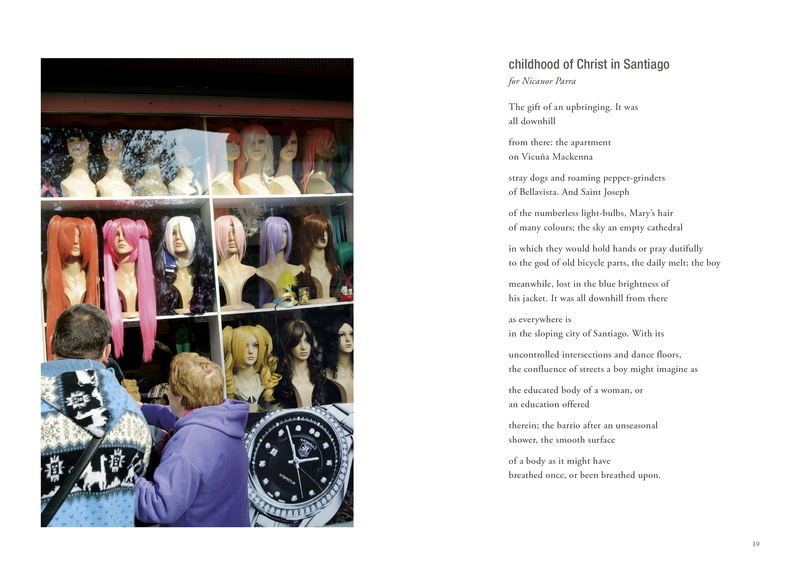 The urban navigation resulted in Citizen of Santiago — a delightful collection of poems and photographs. I have always been a fan of Gregory’s poetry and have often wondered what it is that draws me to it. Partly, I think, the uniqueness of voice; the quirky mind that accumulates detail as the poet inhabits the world, and then the way that detail prompts little tracks of thought that surprise and tumble and turn. The afterword mentions the story that the Architect Cristian Valdes told of the origins of the Valdes Chair (in a nutshell, father and son were playing tennis, and then the broken tennis racquet was transformed into a chair). It also describes how Cristian’s exhibit at the Kermedes show (two free-standing, gib-board structures) might be a prototype for a summer house that could be folded away to one wall in the off season. Gregory’s poem replays the story told, but also acts as a metaphor for the way a poem can be unfolded and refolded. This gets to the heart of what I love about Gregory’s poetry: the way his poems fold in on themselves, delicately, wittily, not just at the level of syntax but also at the level of thought and the layering of music). His lines are flipping what you see or think or feel back in on itself (like philosophical or poetic peelings — you hold the potato peeler). 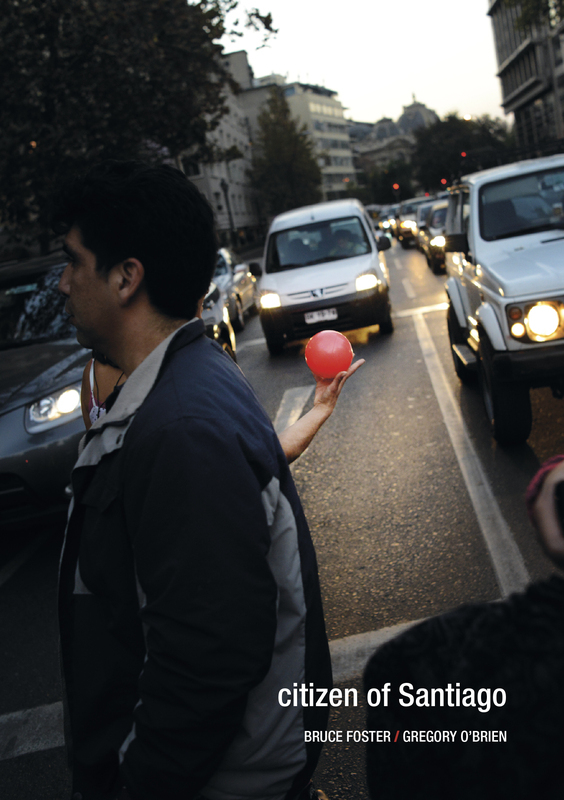 Bruce Foster’s photograph’s also sidestep the expected tourist snapshot. As with the poems, there is repetition, echoes, images folding back into themselves, (easels, legs walking). The photographs place human activity centre stage; a city is more than bricks and mortar, it is a psychological state of mind, communities of people. Strangenesses. Points of empathy. Universal registers (father and son laughing in Bruce’s photo). Accumulating narratives. In one poem, I read: ‘It was all down hill from here/ as everything is/ in the sloping city of Santiagio.’ In one photo, there is a man half hidden by a slanted tree — the tree denies us access to his face (really we only ever get a partial view on any page), but the detail within the frame is electric. The bright pink, plastic crates match the man’s trousers; you leapfrog from the hole in the tree to the diamonds in the crates to squares in the windows. In both poem and photograph, the detail is fertile ground for visual, aural and semantic pleasure. The book, through both image and line, sets you upon the slopes of reading and viewing, and then sends you skating and skimming and stalling in this foreign place. It is a poetic treat. This entry was posted in Poetry and tagged Gregory O'Brien, NZ Poetry review on February 10, 2014 by Paula Green.